One of the problems many CFSer have is getting testing — especially for things at the DNA level. A lab will often charge medical insurance $1000 for such tests. The current cost of getting a human genome DNA is just $25 – talk about inefficiencies! A recent comment asked about whether I had a methylation issue. The answer is yes, I was told that I had one according to my MD, and prescribed methylated B12. It had no apparent effect. 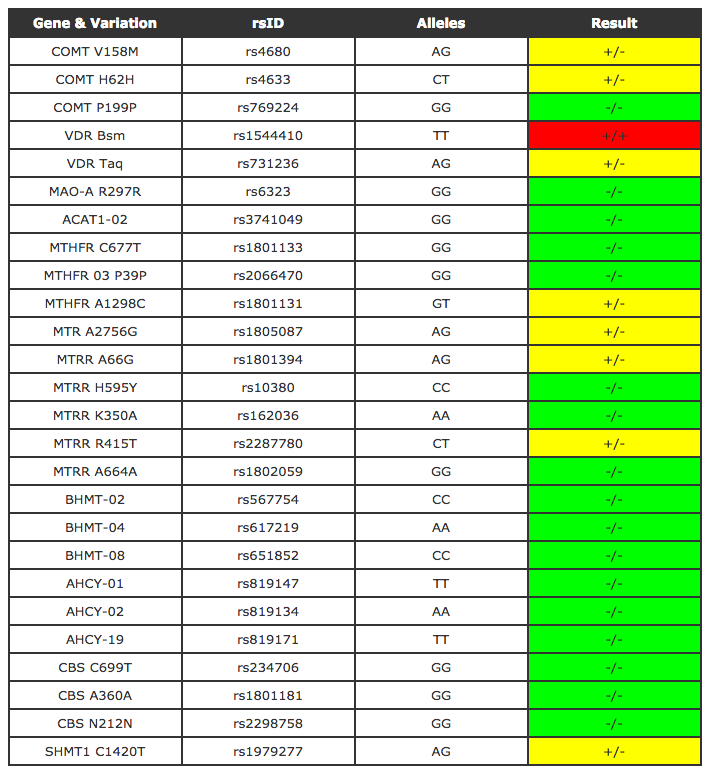 While researching my response, I found a site that would take my DNA results from 23andMe and do an analysis (and deeper analysis that the MD got!!). The site is https://geneticgenie.org – they do the analysis for free (and request a token donation — if you can afford it, do so). My actual results are below. As you can see, my MD’s test likely picked the single red one below and hence concluded that I have a significant issue. Given the numbers of genes involved, many people may have one of these 26 genes being significant — it does not mean there is a problem.